In 1995 there were 81 independent organic processing companies in the United States. A decade later, Big Food had gobbled up all but 15 of them. Corporate consolidation of the food system has been largely hidden from consumers. That’s changing, thanks to tools such as Philip H. Howard’s widely circulated “Who Owns Organic?” infographic. 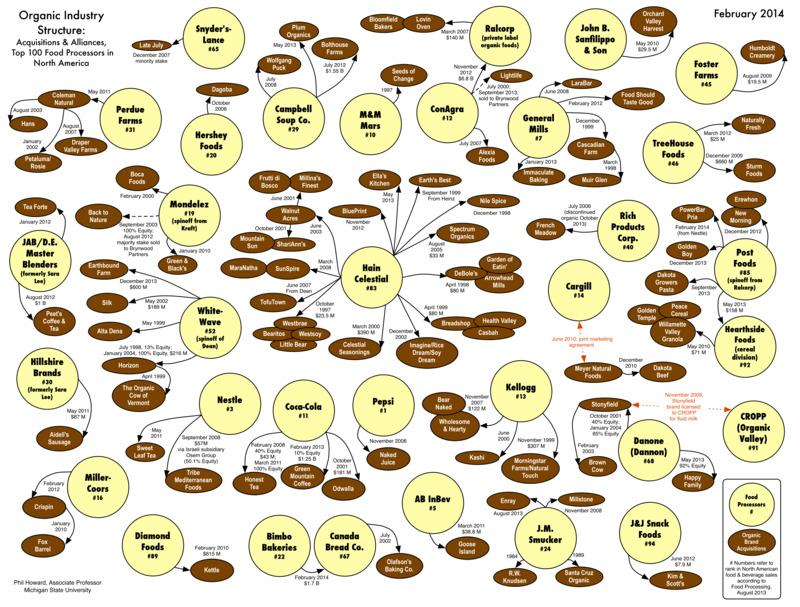 Originally published in 2003, the chart provides a snapshot of the structure of the organic industry, showing the acquisitions and alliances of the top 100 food processors in North America. The chart empowers consumers to see at a glance which companies dominate the organic marketplace. The Cornucopia Institute has been proud to feature Dr. Howard’s work and help supply information helping the Michigan State University researcher keep abreast of the shifting ownership environment in the organic industry. Dr. Howard released an update of the chart on February 13. It is posted at www.cornucopia.org. Dr. Howard released an update of the chart on February 13. It is posted prominently on the right-hand margin at www.cornucopia.org. 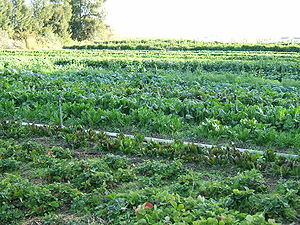 Major changes since the last version (May 2013) include WhiteWave’s December 2013 acquisition of Earthbound Farm, the nation’s largest organic produce supplier, for $600 million, said Howard, an associate professor in the Department of Community Sustainability at Michigan State. Additionally, Coca-Cola acquired a 10% stake in Green Mountain Coffee for $1.25 billion, and Bimbo Bakeries (Mexico) purchased Canada Bread from Maple Leaf Foods (Canada) for $1.7 billion. The chart shows that many iconic organic brands are owned by the titans of junk food, processed food and sugary beverages—the same corporations that spent millions to defeat GMO labeling initiatives in California and Washington. General Mills (which owns Muir Glen, Cascadian Farm, and LaraBar), Coca-Cola (Honest Tea, Odwalla), J.M. Smucker (R.W. Knudsen, Santa Cruz Organic), and many other corporate owners of organic brands contributed big bucks to deny citizens’ right to know what is in their food. Tools such as Howard’s infographic and The Cornucopia Institute’s scorecards rating organic brands of dairy, eggs, soy foods and breakfast cereals empower consumers to make those choices. The updated chart and scorecards are available for download at www.cornucopia.org. Howard has created additional infographics and network animations on the wine, beer, soft drink, coffee and seed industries, as well as on foodborne illnesses and the structure of the food system (www.msu.edu/~howardp/index.html).